The Chantecler chicken is one of only two native Canadian chicken breeds. 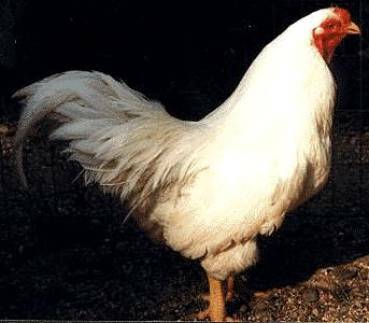 A composite breed derived from Dark Cornish, White Leghorn, Rhode Island Red, White Wyandotte, Columbian Wyandotte and White Plymouth Rock, Brother Wilfred Chantelain developed the Chantecler in the early 20th century at the Abbey of Notre-Dame du Lac in Oka, Quebec. Realizing there were no chickens of Canadian origin at Oka, Brother Wilfred decided to breed a truly Canadian bird, one that laid a lot of eggs during winter, with frost resistant comb and wattles. The resulting bird is indeed extremely cold resistant, and is suitable for both egg and meat production. The Chantecler breed gained a lot of popularity after the first Canadian National Poultry Conference in 1919 and was officially declared a breed in 1921. In December 1999 the government of Quebec officially recognized the Chantecler as a native Quebec breed. The total population size of Chantecler chickens is estimated at between 1750 and 2250 and is listed as Critical by the American Livestock Breeds Conservancy. Current Canadian population size is about 1000-1500 birds, with most of this population is based in Quebec in small farm flocks. Remaining stock can be found in the United States. As one of Canada’s few heritage poultry breeds, Slow Food Canada proudly supports the Chantecler chicken. Where do you buy this kind of meat for cooking? Sorry for the delayed response to your inquiry. Can you let me know where you live? That could help in sourcing a producer or butcher to buy from.